Objective: Two numbers represented by a linked list where each node contains single digit. The digits are stored in REVERSE order, means head is pointing to the first digit of the number. Output: Addition of two numbers represented by a Linked List. Take a variable int carry =0. Initialize Node newHead = null; and Node curr = null. newHead will be the starting node of our result linked list and curr node will the reference to the current node on which we are working in our result linked list. Navigate Both the lists simultaneously taking one node at a time. Add the data of nodes and carry , say you call this as total. Check if total >=10, if yes put carry =1 and total=total-10. create a new node with value total, say you call it as Node ‘n’. check if newHead is null, if yes then and assign ‘n’ to newHead. Now our starting node of result linked list is fixed. if newHead is not null then add ‘n’ to the result linked list with the help of newHead and curr. Now repeat steps 4 to 9 till any one of the list gets over( considering both the list has different length, if both list has the same length then both lists gets over at the same time, you will not need step 11). Now navigate the list ( whichever is remaining) and add it to the result list. (take care of the carry, see Example). You can avoid this step by making sure that both the list has the same length adding 0 at the end of the shorter list , to see the similar implementation click here. 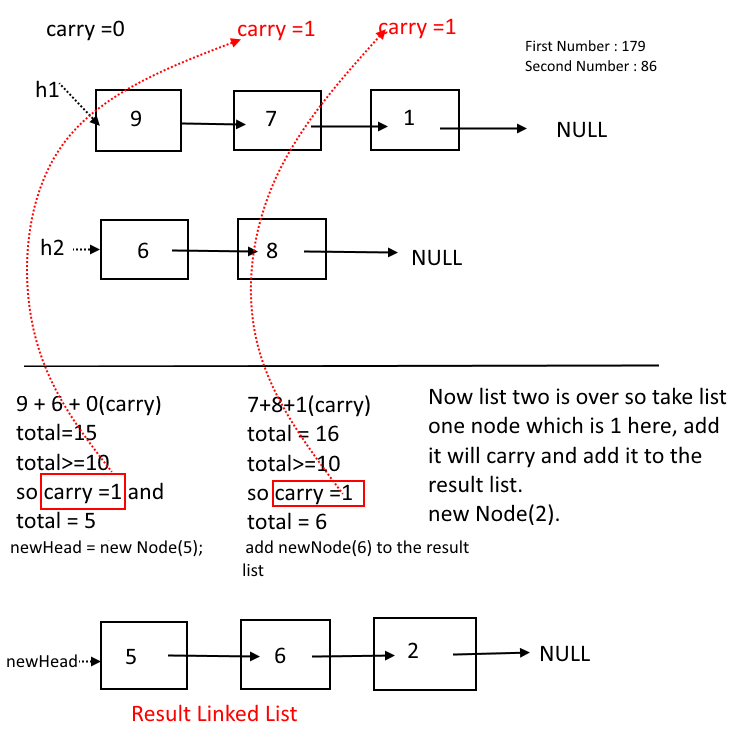 At the End check the carry, if it is not 0, create a new node with value 1 and add it to the result linked list. Previous story Reverse the binary representation of a number. 246 queries in 0.212 seconds.